Paving compounds are quick and easy to apply, they come ready to use and can easily be brush applied to paths, patios and pavements. When applied they form a solid joint that prevents weed and plant growth. 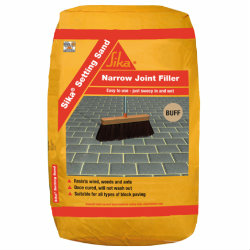 The Geo-Fix, Sika and Easy Joint jointing compounds that we stock are suitable for use on most common paving types. The compounds offer performance benefits compared to cement based mortar. We also stock a wide range of patio cleaners and paver sealers. Buy paving compounds online today. Make your purchase before 2pm and we can even get your roofing materials to you the very next day — shop now!